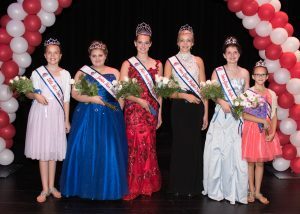 On Saturday November 5th my royal sisters and I attended the Crowning Achievement Pageant in New Richmond, Wisconsin. All of the pageant participants were so excited to be there. They all looked amazing in their formal wear. A few even dazzled us with their talents in singing, dancing and comedy. My favorite part of the pageant was the comedy routine by a contestant nicknamed “Steel Jaguar”. She was so funny! 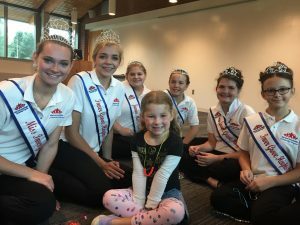 All of us really enjoyed spending extra time with the contestants after the pageant ended. This event was so much fun and it was easy to see how much it meant to the participants. I am so happy we were able to attend! 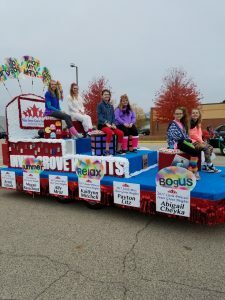 Halloween weekend we had our first parade Monster Bash, in Cottage Grove as a Royal Court. It was so much fun talking with people and other royalty, and seeing all the floats decorated. We won second place for most creative. Our theme was the 80’s, we had records, Pac-Man, Rubix cube, cassette tapes, and more, the crowd loved our music! It was a great day. 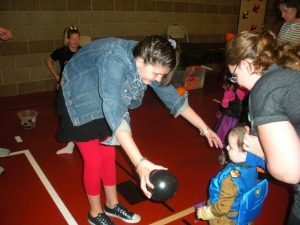 On Friday October 28, the Royal Family and I were invited to go to the IGH Parks and Rec Boo Bash. It takes place at the Veteran’s Memorial Community Center. We were able to help at the craft table, at the games, and bounce house. 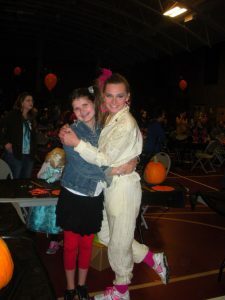 It was so fun to see all of the little kids in their costumes having so much fun dancing and playing. There were a lot of little princesses at the event, but the one that was the best was a cute little garden gnome. My favorite part was taking silly pictures at the photo booth with my Royal Family. We were dressed in 80’s clothes and I think we are looked totally tubular. On October 27th, the Inver Grove Heights Royal Family helped out at the Good Samaritan Society – Inver Grove Heights. They hosted an annual spaghetti dinner fundraiser linked with a silent auction. The royal family helped serve food. We met many friendly faces in our community from Good Samaritan and their supportive families. The dinner was catered by Hometown Meats and it was absolutely DELICIOUS! This was a really fun event and a great way to help the guests at Good Samaritan. 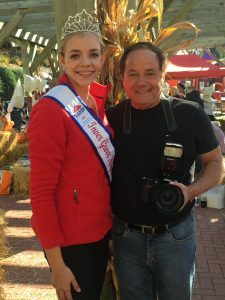 I had a great time meeting with my sponsor Dan Grevas during our local Gertens Halloween Event. I’m honored to have had Dan Grevas Photography as my sponsor throughout candidacy and look forward to this upcoming year. I had a fantastic experience at Dan Grevas photography when I had my senior photos taken last year and I have had an equally as great time getting to know more about him and his company. I look forward to seeing and learning more about Dan Grevas Photography throughout this year at future events! 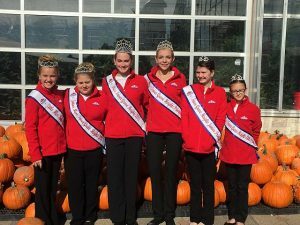 On Saturday, October 22, my royal sisters and I participated in the Gertens Halloween Festival. At this event, we helped kids make human sized scarecrows. When I was working at the scarecrow activity, the kids made their scarecrow unique and special to them. The older girls read stories with lots of emotion to the little kids. Everyone got to be in charge of a game, such as pumpkin tossing, bowling, spin the wheel, and tic tac toe. Also, the most popular activity we managed was the scary bouncy house maze. At this event I got to use my communication skills to help the children, and talk to their parents. At this event I learned to become more comfortable sharing instructions and making conversations with other people. 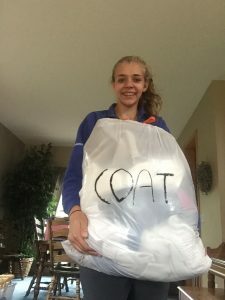 My first community service project as a member of the Inver Grove Heights Royalty Program involved me organizing and running a winter clothing drive. I organized this event in order to support our local Salvation Army which is an organization that helps communities have access to items that are inaccessible to many people. In order to find donations I created a flyer and asked for donations from neighbors, family members, coworkers and classmates. 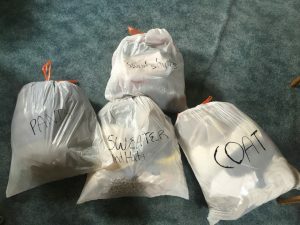 The items were then brought to my house and put into a designated bin or I went and picked them up. 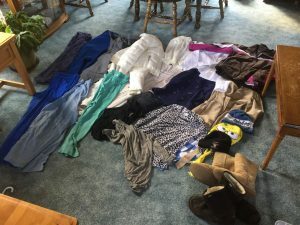 The items that I collected through this process included MN Winter necessities such as hats, jackets, pants and sweaters. I then called the Salvation Army location in West St Paul and had the items picked up and delivered to their facility located on 7th Street. The Salvation Army worker was very thankful, and I’m glad to have been able to help their organization as well as members of our surrounding communities before the cold winter months arrive. 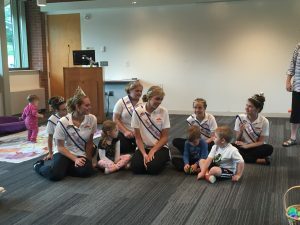 On Saturday, September 17th my royal family and I had the opportunity to attend an event known as “Mother Goose Olympics” which was held at Inver Glen Library. This event allowed for community members children to come to the library and play poetry themed games. Typically this event is held outside, but due to weather the event was moved inside and the kids still had a blast. At this event I assisted with different games and my goal was for the kids to have fun! This event ended with bead necklace making and the kids even got to take home a prize bag! It was great seeing the preschool age children having such an amazing time with us as well as seeing how much they looked up to us as royalty.